Ok, its been way too long since I've posted some new stuff! SORRY! So far our week here has been going good. Nothing much out of the ordinary. Potty training is still fun... ;) I found some Thomas the Tank undies, so I'm going to get them today to help entice Aaron to use the potty more! I am tired as usual, so that's nothing new! I work Monday-Saturday this week. So Sunday I will go to church then probably just REST! 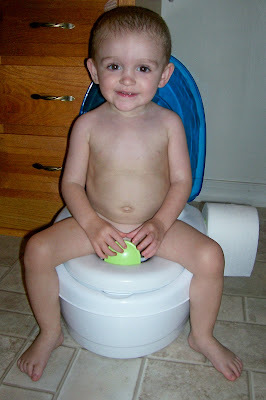 I'm hoping to at least get Aaron's potty page scrapped! 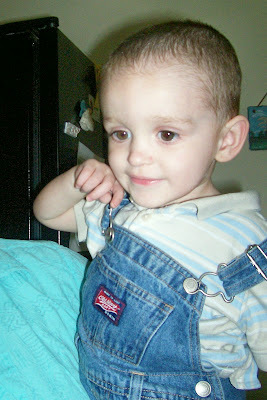 Next week I have my 6 month check-up for Alex plus I'm having a HUGE yard sale!! Really trying to get the house ready for Alex, so we have lots of stuff that needs to go! Plus a few extra dollars in my pocket can't hurt anything! We have pretty much all of the "big" stuff for the baby, but we do need to get a new playpen because ours was ruined when Aaron's old babysitters house caught on fire. So hopefully I will make enough money to get a new one! Really getting excited to meet Alex, but August seems so far away! Here are some new goodies I've gotten recently. I didn't need anything new, but I've been a little emotional lately with all these crazy pregnant hormones, and shopping does make me feel better! :) I got a cute little baby boy paper pack in the $1 bin at Target. I got the tinsel ribbon and the 5 ribbon spools at our local ribbon outlet for 10 cents each! The 2 packs of American Crafts ribbon and rub on letters came from Big Lots for $2 each! I finally got the Swiss Dots Cuttlebug folder and the My Community cart I've been aching for from Custom Crops! CAN'T WAIT to get some crafting done with it! At Happy Scrappers this past Saturday, we all brought some craft items and had a yard sale! It was great! I got a few magazines for a quarter, a really neat clip art book, and the cutest SU! set called "Rainy Days". I wasn't feeling the best that day, so I only stayed a few hours, but they were a great few hours! I love getting together with the girls for the day! Such a nice vacation from life! Here are a few layouts I made 2 weekends ago. 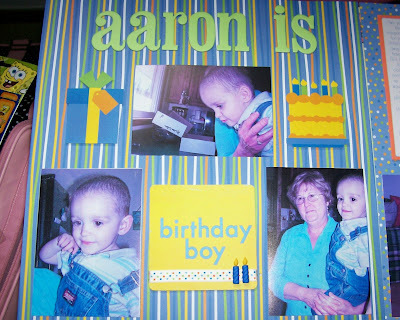 Got to scrap Aaron's birthday pages which was fun. Can't believe my sweet pea is 2! We didn't have a big party this year because I haven't felt well, plus Jamie's grandmother passed away 2 days before Aaron's birthday, so we didn't really feel much like a party. We did get him a cake though and shared it with my grandparents! He also got lots of presents since he's SPOILED ROTTEN!! 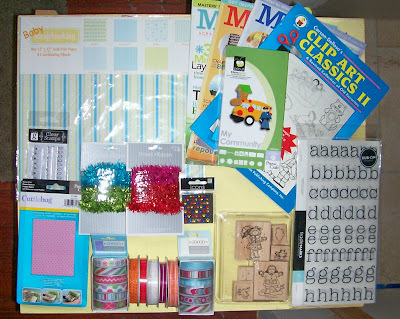 Supplies: Patterned paper, circle stickers, present and cake stickers-Pebbles Inc.; "Aaron is"-K&Co. 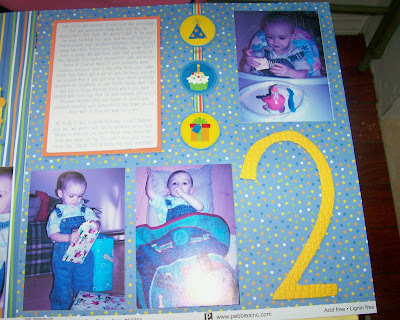 chipboard; Birthday Boy-My Minds Eye; Striped and polka dot ribbon-American Crafts; 2 cut with Zooballoo cart and embossed with Mosaic Cuttlebog die. This was another page I did a few weekends ago. VERY simple, but that's ok! 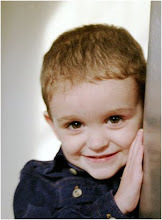 These were the pics of the kids with the Easter Bunny, which was Aaron's first time meeting him! 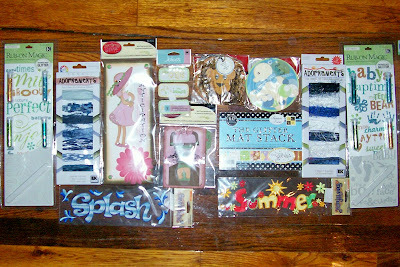 Supplies: Cardstock; American Crafts blue rub on letters; Patterned paper-Doodlebug; Circle cut with George; Bunny cut with Doodlecharms; miscellaneous ribbon; Prima stack with a MM crystal brad in the center. These last 2 layouts were done this past weekend at HappyScrappers! 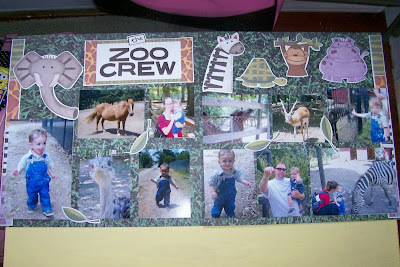 I finally scrapped these pictures from our visit to a local zoo last summer! 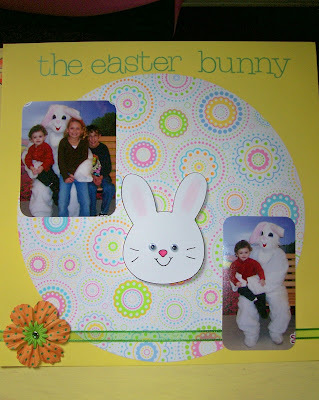 Supplies: Grass paper-Karen Foster, pop dots, Zoo die cuts-Reminisce (I think!). 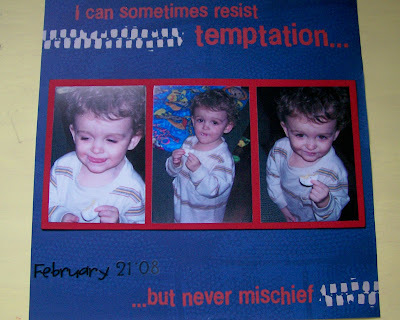 These are the pics from my little monster when he snuck into the donuts a few months ago! Supplies: Paper (says "I can sometimes resist temptaion, but never mischief! )-Reminisce, Letter stickers-TLC. Left that blank space towards the bottom for journaling! Well that's all of my new stuff for now. I am hoping to scrap a little this weekend, plus I want to start on my new project-the table I took all of these photos on. It was a yard sale special! It is all wood with 2 chairs. The woman was handpainting it but never got finished. So I am going to redo it. Think I'm going to do it in primary colors and Modge Podge some cuts from my new cartridge on it! Trains, planes, cars, and trucks. Then I'm going to put Aaron's name on one chair and Alex's on the other! Can't wait to start on it! Will post pictures of my progress! Hope you're all having a GREAT week! Thanks for stopping by to visit! I'm so nuts about this kid! I am off to get ready for church, but I will be back later to post a few layouts I made last weekend, some recently purchased goodies, and a recap on HappyScrappers yesterday! Hope you all have a great day! Yummy candy on Lim's Blog! Go check out Lim's blog for some delicious blog candy! Also check out the rest of her blog-her work is amazing! Just wanted to update you guys since I haven't posted in a little while. Life has been so crazy. Last week my husband's grandmother passed away. As hard as that was, I believe she is happy and healthy and in a much better place now. If you go back a few posts you can see a layout titled "Aaron and Oma" and that is her. Last week was also my little monsters 2nd birthday. I feel like he was just born, and now here he is two years old with a baby brother on the way. I can't believe it. Needless to say his birthday plans changed since Oma passed 2 days before his birthday, but we did get him a cake and spent some time with my grandparents opening presents. He got a ton of clothes, which was the only thing he really needed. So now his closet is overflowing! Jamie and I got him the Bee Movie, and he's been watching it everyday! This weekend he will get to see more family and get more presents, so I'm sure he'll be thrilled. Not that he needs anything-he is so spoiled rotten. But that is all for now. Have to go to work-its my 2nd day out of 6 straight-I am so tired. Just wanted to let you all know I am still here, just getting huge and tired! Also wanted to share a pic of Aaron! :) If I will be back to post some new layouts after HappyScrappers next weekend! Thanks for stopping by! Ok, so I had to work all day yesterday-which was my 6th day straight-and I decided to make myself feel better by indulging in a little retail therapy! 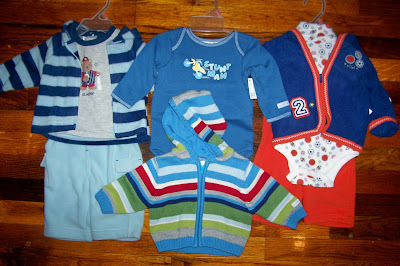 My first stop was KMart because they were having this huge sale, and I got some outfits for Alex! :) I only paid $1-3 for them! The two 3-piece outfits are fleece, so they'll be perfect for this fall, and I LOVE the little onesie that says "Stunt Man" on it! Too cute! My next stop was ACMoore because they had all of their Cricut carts on sale! This was the main reason for going out last night because I really want Opposites Attract or My Community. Of course they had none when I got there! But they did give me a rain check. I only ended up getting a DCWV mat stack for my cards there. So I was a bit depressed that I didn't get to spend any money! But then I remembered my mom told me that Ollies bought a bunch of scrapbook stuff, so I thought I'd swing by and see what they had! (BTW, Ollies is like this huge bargain outlet, kind of like Big Lots, but cheaper!) They had so much great stuff! Look at the 2 albums I got! They are both Just Jinger and were $5.99 a piece! I've been looking for a new album for Aaron because I've been getting a new one every year since his scrapbooks fill up so quick! And his birthday is on Thursday, so its time for a new one! I love how this album opens in the middle! Its cute and cheap-how could I go wrong! I also got 2 packs of acrylic stamps-one with words and the other is winter. Guess how much they were?? 99 CENTS!!! Here's most of the little embellies I bought. I got 2 K&Co. glitter rub ons ($1.99), 2 packs of fibers ($1.99), and all the other embellies were only 99 cents! (Except my mat stack of course!) I got 2 really cute pregnancy embellishments, one is a little pregnant woman in a hat, and the other has little feet on a scale and says "Worth the weight!". They also had lots of Jolees for only 99 cents. I could've bought everything! Well, I guess that's all for now. Just wanted to show someone who would understand all of the fun things I bought! I tried to show my husband and he said I was talking Greek to him! I hope you all had a great week and an even better weekend! I will be home cleaning after church and getting ready for our yard sale next weekend, and I'm hoping to scrap a little! Wish me luck! Thanks for stopping by! Anybody have any scrappin' trips coming up? I was just wondering if any of my blogging buddies have any fun scrappin' things coming up?! I have LOTS! 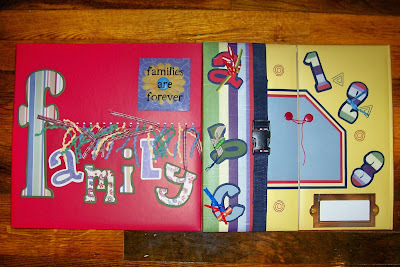 First off I'm going to a HUGE scrapbook yard sale about an hour and a half away at the end of the month! I am so excited! I went last year and LOVED it and got some great deals, so I can't wait! It is in a huge indoor fairground building, and I can't wait to see what "treasures" I find this year! Secondly, my very good friend Jill and I are planning to take a 2 day mini road trip to all of the scrapbook stores within about a 3 hour radius. Its going to be awesome and a much needed vacation, even if its just for 1 night! Hopefully we'll be able to go in May or June, because I'd hate to go into labor while I'm out of town! And last but not least, I am all registered for the Great American Scrapbook Convention coming up in June! Last year I was lucky enough to spend 3 days at the Creating Keepsakes Convention, and it was a blast! This year we'll only be going for 1 day, and I'm only taking 1 class (a kid class of course!) but I can't wait to go shop all the goodies!! I've already started saving up for all my fun trips coming up! So do any of you have anything fun coming up? !